Just under an hour ago, Diego Maradona walked into a packed press room to give a prepared speech to Argentina’s press on his thoughts after refusing to sign the contract extension the AFA offered him yesterday. He fired some shots across the bows of the organisation, but didn’t come out with anything truly incendiary. All the same, both AFA president Julio Grondona and national teams co-ordinator Carlos Bilardo came in for some tough criticism. ‘Grondona lied to me, Bilardo betrayed me,’ was the phrase that’ll probably be printed up and sold on t-shirts across Buenos Aires by midday tomorrow. 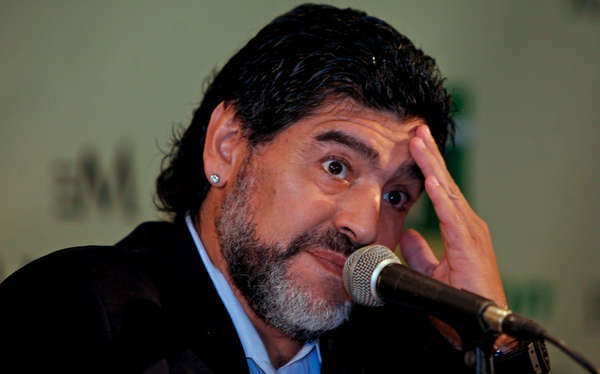 When Maradona entered the room, he was treated to loud applause and chants of support from one group of journalists, before the co-ordinator announced that he would read his speech and then leave – there would be no questions. ‘When you’ve listened to what I’m going to say, you’ll see loud and clear what a price I had to pay,’ he told them before beginning. ‘Grondona told me in front of the players; “I’m really content with the work you’ve done, and I want you to continue [as national team manager],’ Maradona said. ‘Grondona lied to me, and Bilardo betrayed me. I just wanted to defend my people [his assistants and other technical staff], and I’m not going to change… and I want to tell you all, there are people [running the national side] who don’t want what’s best for Argentina; they’re only in it for personal gain.’ He then ended with, ‘everyone knows how much the selección means to me,’ before leaving the stage. Argentine sports journalist Juan Pablo Varsky afterwards made the excellent point on Twitter that, ‘if Grondona hadn’t lied to Maradona about wanting him to continue as coach, Maradona wouldn’t have been able to play the victim today.’ Diego’s gone, then – but not quietly. You can follow Maradona, Grondona and all other things Argentine and footbally during the winter break and beyond into the 2010 Apertura via HEGS on Twitter. If you’ve not signed up yet you can do so here. the putting down of the rabid boar is difficult even with the thickest of gloves: the bites went clean into the hands and the medics need a deep needle that appears to have gone missing… needless to say AFA needs a new pair of gloves but i’m afraid they aren’t in a shopping mood and all of this contraversy is for naught. i’m wondering if an AFA coup-de-etat is even viable?